Is your current Color copier not coping with your business’s printing demands? 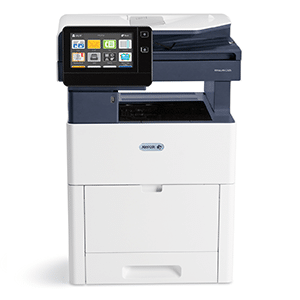 The Xerox Versalink C505 color copier has been specifically designed for fast-paced work teams. Right out the box, you can count on this copier to consistently and flawlessly perform the tasks that make your business work more efficiently. Minimal IT support is required for set up as Xerox provides step by step installation wizards to get you up and running hassle free. This copier has been designed to contain fewer moving parts which means less breakdowns and less engineer calls. Keep up with the latest mobile printing and download Google Drive, Dropbox and OneDrive straight onto the device from the Xerox app gallery. This copier gives you the freedom to work where and how you want. Customize the way you want by adding additional paper trays, an optional 32gb hard drive or a cabinet for storing paper and toner cartridges to save additional office space. You can count on superior print quality to make your work look its best. A print resolution of up to 1200 x 2400 dpi delivers sharp text and fine line detail, plus exceptional color vibrancy. Is it time you upgraded to make your business more efficient?